The PlayStation Gold Wireless Headset is not actually made of gold, nor does it feature any gold branding or gold paint. There's no gold anywhere, in fact. The headset, which Sony is selling for $99, is mostly black, with a stylin' blue streak around the inside of the headband. It works with both the PS3 and the PS4, though it's being marked pretty hard toward PS4 owners. There are buttons along the front and back of the left earpiece, which let you adjust the volume, toggle the "VSS" virtual surround sound, mute the headphone, switch between two EQ presets, and adjust the game/chat sound balance. There's also a mini-USB jack on the bottom for charging (a tiny cable is included for this purpose) and a stereo jack that, via the included male-to-male 1/8" stereo cable, allows you to use the gold headset as a regular ol' unpowered stereo headset. I've been using the headset for the past month or so. Here are some things I like, and some things I don't like so much. Comfy. The gold headset isn't all that durable—it's plastic, and the fit feels cheapo and loose at first. But I quickly got used to it, and actually have found that I like the fit. The headset is very light, and I've been able to wear it for lengthy periods of time without growing uncomfortable. Here's me wearing the headset, featuring what I'll call "Monday Hair." Not bad for music. I'll probably never have a pair of headphones that I like more for listening to music than my AKG 240 Studios (which, incidentally, go for a mere $79 these days). However, I don't dislike Sony's gold headphones for music-listening as much as I thought I would. They have a nice and wide stereo field, and while they're very treble-heavy, recordings still come out fairly clear. The gold headset is designed with gaming in mind, but it works for music, too. Versatile. The gold headset comes with a wireless USB dongle that works not only with your PS4, it also with any PC or Mac computer. You can simply plug it in and your computer should automatically recognize it, letting you use it for audio input and output. While dongle-free Bluetooth functionality would've probably been preferable, it's still nice to use a flexible, non-proprietary piece of gaming hardware. The included 1/8" cable lets you plug it into any other device that has a regular headphone jack (including a PlayStation Vita or a PS4 controller) or even use it on a phone or computer for Skype calls. You can also charge the headset using the same cable you use to charge your PS4 controller. Custom EQs. Sony has been touting their headset app for the PS4, which lets you load up prefab EQ settings designed specifically for the gold headset. In the app, there are a number of generic genre settings like "First-Person Shooter," and also specific packages, like the EQ settings assigned to PS4 exclusives like the open-world game Infamous: Second Son. The different EQ settings do make a difference, though I have mostly found myself sticking with the one with the most bass to make up for the headset's top-heavy default. Still, it's a cool idea. It remains to be seen how much Sony will do with custom EQ settings for future games. Space-hog. The gold headset takes up space in one annoying way: It requires a USB dongle to work wirelessly. That's not a huge deal if you're using it on a PC or Mac with a bunch of USB ports, but the PS4 only has two. That means that if you're like me and always have one PS4 controller plugged in and charging at all times, your other spare USB port will be dedicated to the gold headset, leaving you no way to plug in, say, a USB keyboard for all that time you're spending chatting in Final Fantasy XIV. Though it probably would've made it more expensive, it's hard not to wish the headset had been able to pair wirelessly with the PS4 over bluetooth. Cheap build, cheap sound. When it comes right down to it the gold wireless headset is another gaming headset that costs more than it ought to, given its build and sound quality. If you buy a gold headset, you're trading audio quality and durability for wireless capability and virtual surround sound. Not necessarily a bad trade, but one to be aware of. The wireless mic is less than amazing. Most wireless headsets make a trade-off in terms of how clear the microphone sounds, but the gold headset's mic seems particularly muddy. Here's an audio file I recorded on my Mac in Audacity; first I recorded using the wireless mic, then I plugged the headset in using the included cable. The difference in audio quality is immediately noticeable. Don't lose that cable. The gold headset's versatility is one of its primary selling points—with its included 1/8" cable, you can plug it right into a handheld system, a laptop, or even an Xbox One chat adapter and use it like you would any other headphone/mic headset. Unfortunately, you'll lose a lot of that versatility if you misplace the cable, which is easy to do, given that it completely unplugs. You'll want to be sure to store it in the included tote bag, lest you need to go buy a replacement. Virtual surround is only okay. The gold headset's VSS setting is fine, but it doesn't come close to the smoothness of the headphone-surround conjured by more expensive headsets that use actual Dolby Headphone processing. Sony's headphones create a decent-sounding 360-degree space in open-world games like Assassin's Creed IV (which is actually a better reference than Infamous: Second Son due to the latter game's oddly empty soundscape) and can lend helpful positional data in first-person games like Killzone Shadow Fall. But unsurprisingly, they can't compete with my Astro A50s, though it must be said that the A50s go for three times the price of the gold headset. Finicky app. 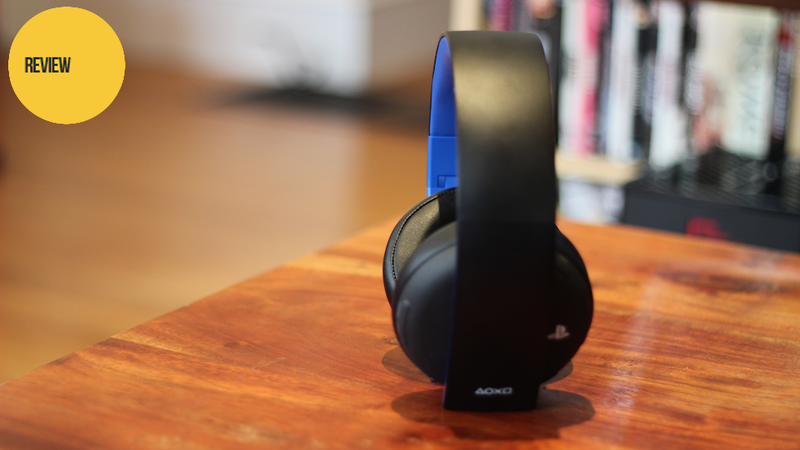 The PS4 headset app is a cool idea in theory, but finicky in practice. To change EQ you'll have to suspend (though fortunately not quit) your game in progress, load up the app, and switch out the EQ setting. Considering how easy it is to do most other things related to the headset, the slowness of the app is a bit of a bummer. The Gold Wireless Headset isn't a bad option for a hundred bucks, provided you primarily want something to use for video games. It doesn't offer the audio quality of a comparably priced wired pair of studio headphones, nor does it offer the bass response and Dolby surround of a more-expensive game-centric alternative. But as a mid-tier wireless gaming headset, it's decent-sounding and versatile, with a snazzy design, functional headphone surround and a surprisingly comfortable fit. And while it's not actually made of gold, well, that would probably make your neck sore anyway.